Has Tony Harnell left Skid Row? This would be quite the blow for Skid Row if that was the case given that the group just parted with its long-time frontman Johnny Solinger earlier in 2015. Solinger had fronted the band since 1999. Other lead singers according to Wikipedia that Skid Row have had include Matt Fallon (1986-87), Sean McCabe (1997-98) and of course the incomparable Sebastian Bach (1987-1996). 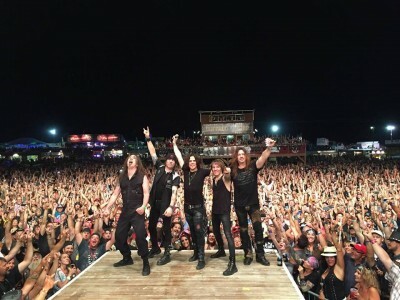 Changing lead singers on a consistent basis has usually spelled the death or at least the downfall of many bands so it will be interesting to see if Tony Harnell and Skid Row have indeed parted ways. If Harnell and Skid Row are no longer, this appears to pave the way for Skid Row to reunite with Bach which would likely result in Skid Row being the frontrunners to secure the opening slot on any Guns N’ Roses‘ reunion tour.